There isn't a road east of the South Honcut Creek Arch Bridge. 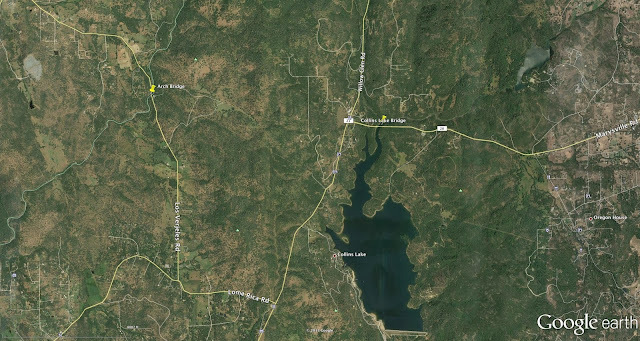 Instead, Los Virjeles Road continues south to Loma Rica Road before coming back north on Marysville Road, which turns east at Collins Lake (see Google earth photo below). This reservoir was formed by damming Dry Creek and it's crossed by Marysville Road on the four span Dry Creek Bridge (16-0004). 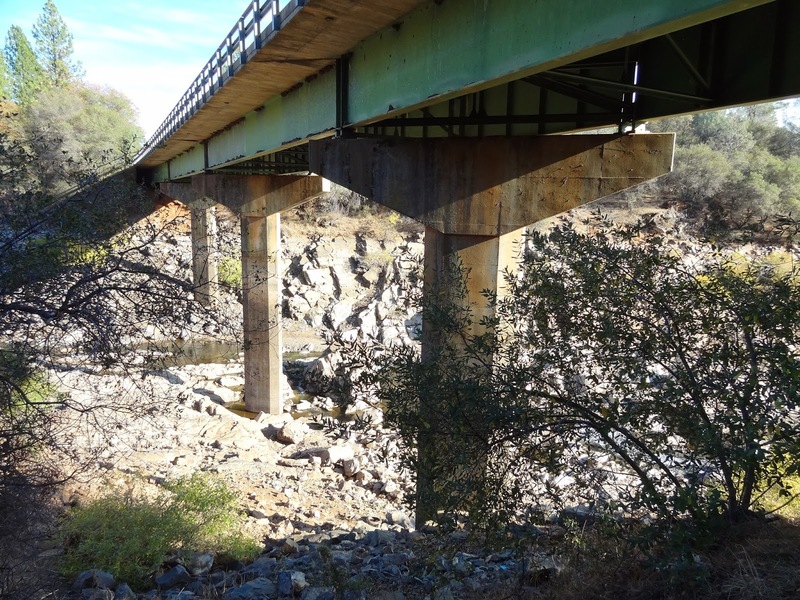 It is a four span steel girder bridge on hammerhead bents and the columns and river banks are strangely colored from the frequent rising and lowering of the creek. I had taken these photos at around 4 PM and so the light is a little dusky from going through so much sky. 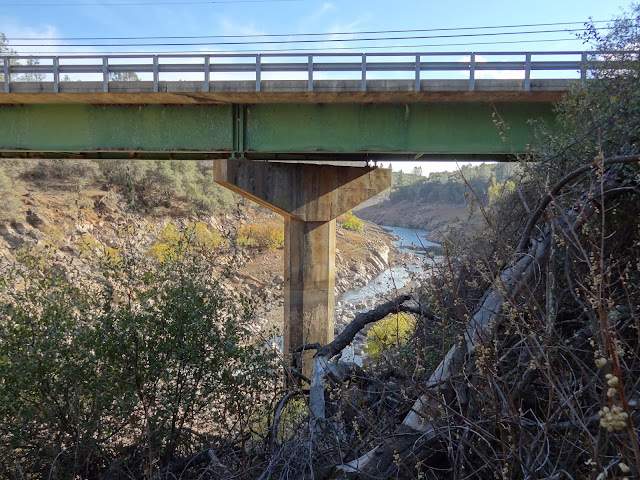 The Collins Lake Bridge is 328 ft long and composed of four 80 ft spans with a 33 ft wide deck on a 45 degree skew. The bridge is in fair condition, it has a sufficiency rating of 74.6, it was built in 1963, and it carries less than 2000 vehicles a day. 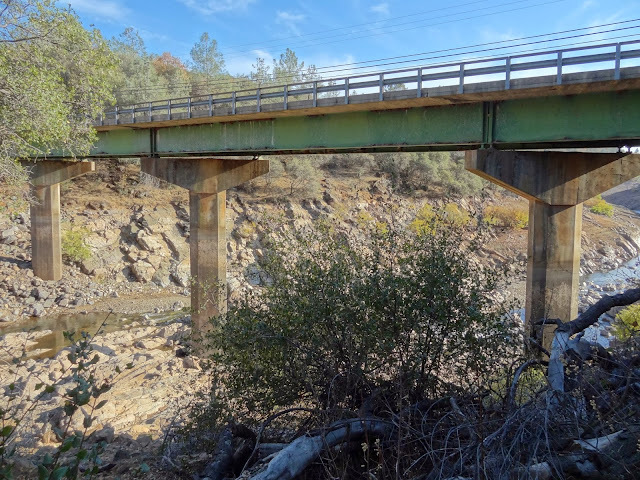 Yuba County, California Bridges: Marysville Road Bridge across Collins Lake by Mark Yashinsky is licensed under a Creative Commons Attribution-NonCommercial-NoDerivs 3.0 Unported License.